Thinking of grey brick wallpaper for your space but you’ve had self-proclaimed purists tell you it’ll look cheap and cheesy? Technology has come a long way since the 60s and brick murals are better than ever! 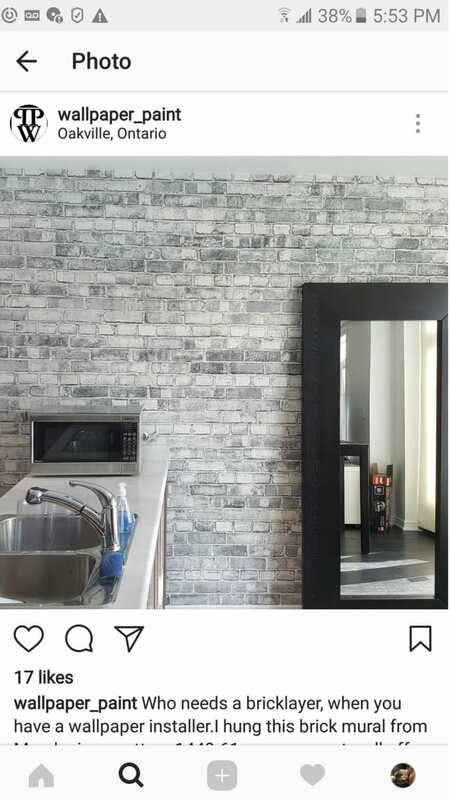 I’ve spent hours asking my customers for photos of their grey brick wallpaper so that you can see just how stunning it can be in real, live rooms (scroll down to see them). 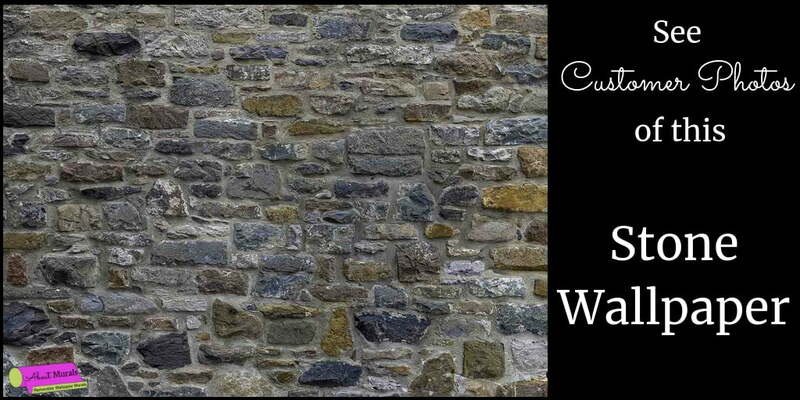 Grey brick wallpaper – with no repeat pattern! There are no repeat patters in my grey brick wallpaper. You know…when you can see the same pattern on a wall over and over again? 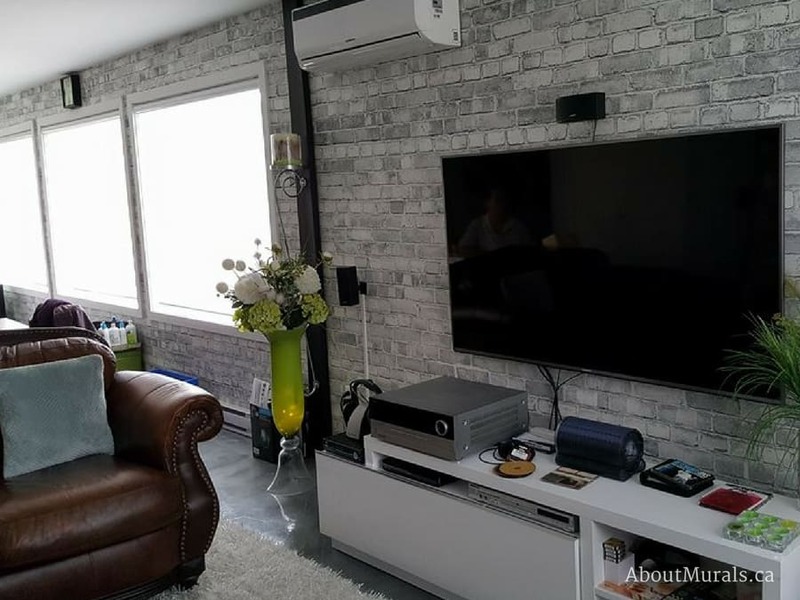 Mine is actually a wallpaper MURAL created with a high resolution photo of a real brick wall, so it looks crisp, clear and realistic. If you’ve ever removed old school wallpaper, you probably cursed it and swore to never use wallpaper again. I get it! BUT my wallpaper murals are all removable! I even put together a how-to video to show you how it comes right off the wall. So, even though this bedroom looks light and airy with all the white against the wallpaper – when my customer is ready to re-decorate, she just needs to pull the grey brick wallpaper right off. For all my DIYers out there, I made a how-to-hang-this-wallpaper video. But if you’re not into projects like this, I have two options for you! If you’re in Southern Ontario, I offer wallpaper installation services. If you’re elsewhere (most of my customers are in the USA), you can visit the Wallcovering Installers Association to find someone in your area. 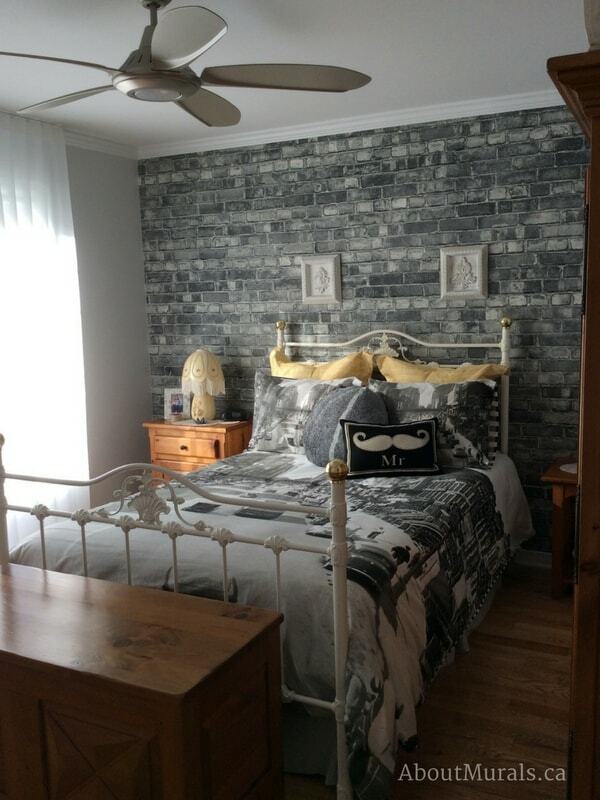 Now back to my customer’s photo…don’t you think it’s funny how the same grey brick wallpaper can look different in different bedrooms? Do you think the darker bedding and the “Mr.” throw pillow makes the grey effect wallpaper look more manly? All my wallpaper murals are non-toxic and won’t affect the air quality in your home like other wallpaper out there (and even real exposed brick walls with all the dust they spew). Speaking of real exposed brick walls, it’d be way harder to hang cabinets. But it’s super easy to hang anything over wall murals. 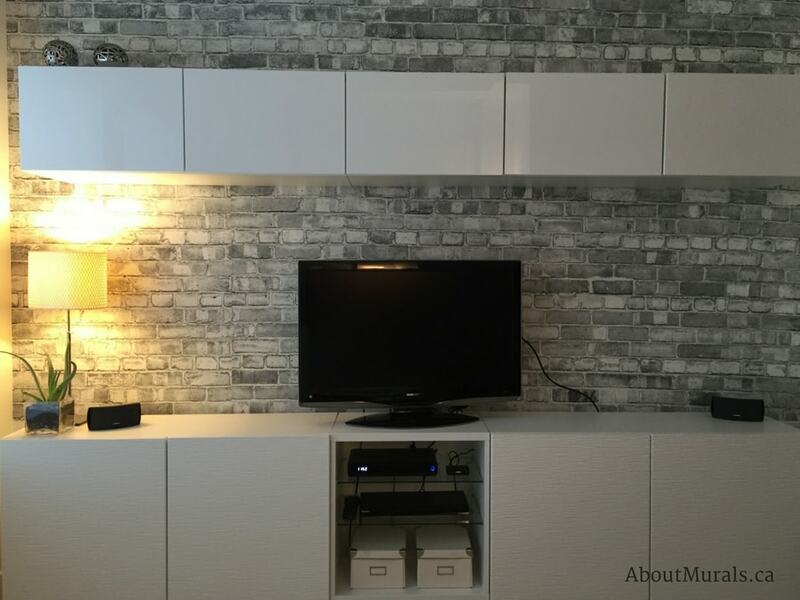 Would you hang DVD storage cabinets over wallpaper or just use free-standing cabinets instead? Do you have a super wide wall? It can be hard to find wall murals (that have no repeat pattern) in a really wide size. This wallpaper comes in 6 sizes…and one is even 36′ wide! 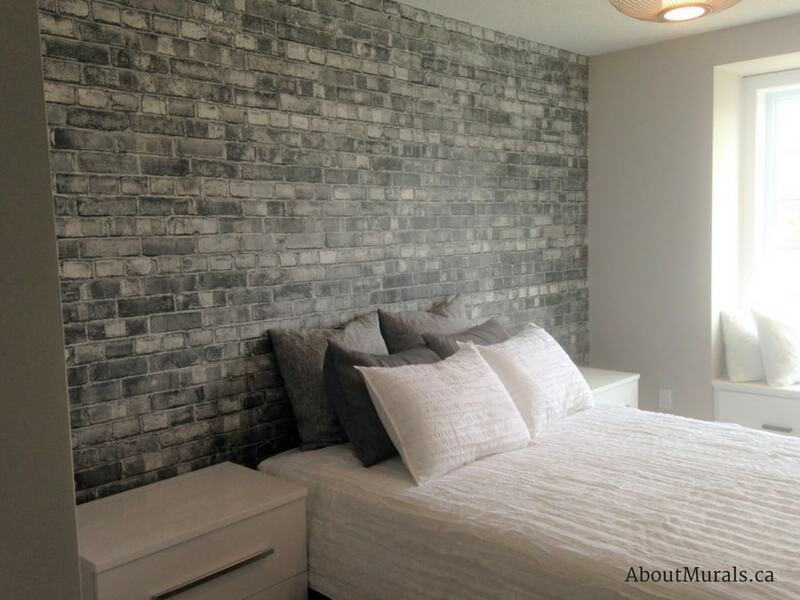 See my brick wallpaper on Cityline! See what Colin and Justin think about my red brick wallpaper on this episode of Cityline! All of my brick and stone wallpaper, including the grey brick, is made the same way so you’re guaranteed a crisp, clear looking mural! You can wipe it down! Worried about food splatters in a dining room? All my wallpaper murals can be wiped with a damp cloth! This customer added a sparkly chandelier and flowers on the dining room table to soften up the grey brick wallpaper. Why does it look so realistic? 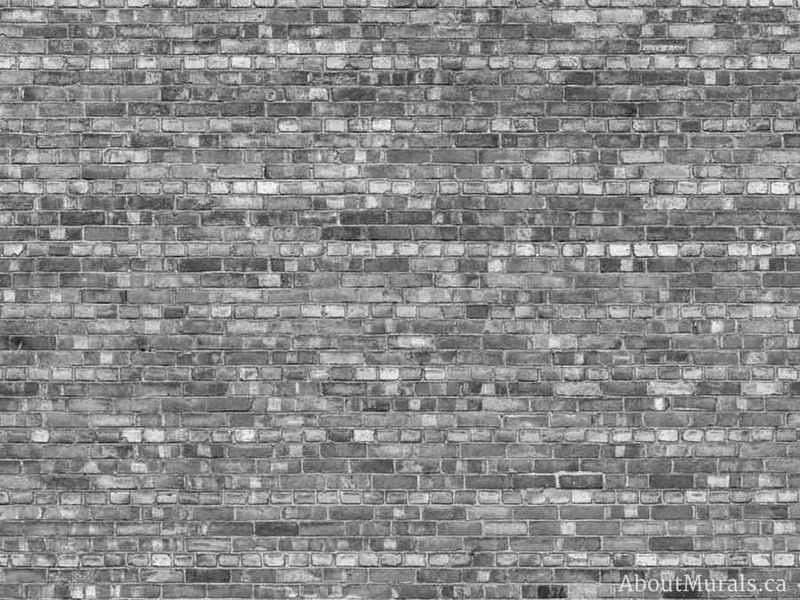 The photographer takes 74 small, individual photos of a large brick wall (capturing all the dents, divots and character) and then stitches them together in photoshop, creating a super high resolution image that gives a crystal clear wallpaper. 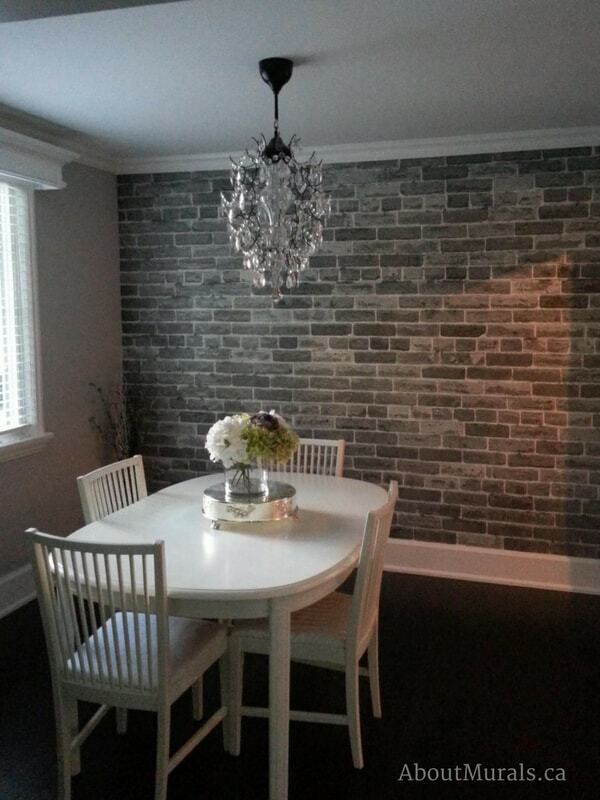 This photo comes from installer @wallpaper_paint from a customer’s home in Oakville, Ontario. Do you think it gives the kitchen a lofty feel? Even though Colin and Justin think my wallpaper is super realistic looking and with all the customer photos I’ve shared, it can be hard to tell how my brick wallpaper looks up close. IF this is a concern for you – I totally recommend buying a wallpaper sample. 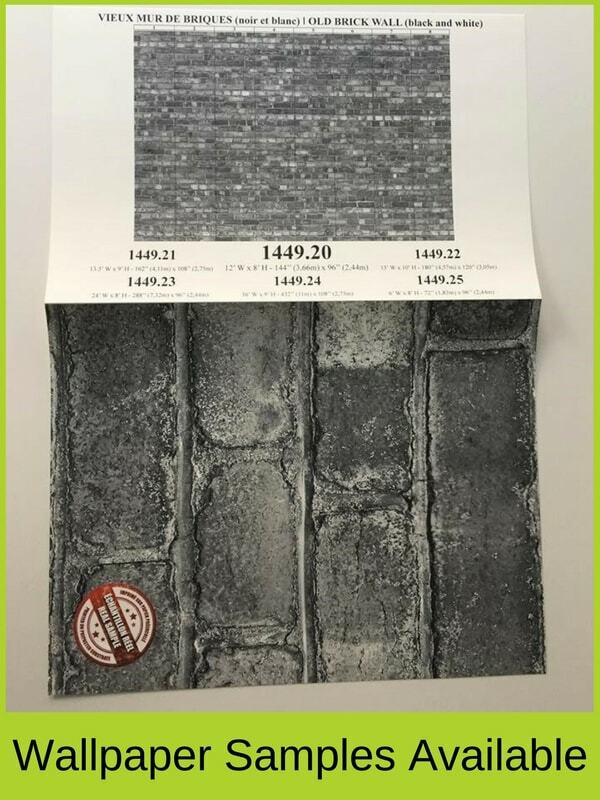 Why buy your grey brick wallpaper from me? If you liked looking at these murals and love a hot deal, why don’t you become a part of my newsletter community? You’ll see more customer pics and hear about my latest wallpaper sales and coupon codes.